The scaling between star formation and gas content follows a tight relation when considering whole galaxies (the Schmidt-Kennicutt Law), but quickly unravels when zooming into galaxies. The relation is now being investigated on two fronts: that of high redshift galaxies, finding that it appears to hold at least in general; and that of increasingly smaller regions within galaxies, finding that the physics increases in complexity and the scaling may present many different forms. 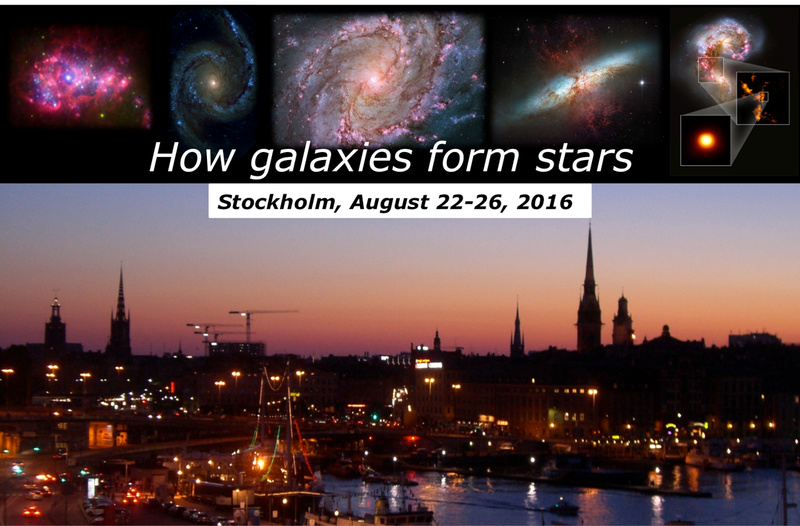 The goal of this conference is to bring together experts of both the stellar and gas distributions in galaxies, and explore avenues for reconciling the global and local scaling of star formation. how stellar population evolution and dynamics affect measurements of local star formation. Stars evolve both in time (ageing) and space (migration, structure dissolution), and stellar populations survive over much longer timescales than the gas structures they are born from. Currently, it is unclear how lifetimes and migration affect local measurements of star formation and gas content. Topics for discussion will be how to reconcile these measurements, and how to link the local to the global measurements. the role of feedback. Mechanical, thermal, etc. feedback is likely to regulate the process of star formation over multiple scales, from those of small star groupings to those of large galactic structures (arms, bars, etc.). The collective effects of multiple discrete sources act to possibly both trigger and quench star formation. Feedback-driven turbulence may even be one of the key ingredients, together with magnetic fields, responsible for the low efficiency of star formation. Predictions from models of feedback, however, still need to be fully tested against observations, over the multiple scales that range from clumps and cores to those of whole galaxies. The role of feedback in initiating, sustaining, and suppressing star formation will be a topic of debate, together with other mechanisms, both from a modeling and observational point of view. how the above physical processes evolve with redshift. Almost all physical quantities used to parametrize high redshift galaxies are derived from calibrations on nearby galaxies (or even the Galaxy itself). Observations of distant galaxies are subject to the limited range of physical scales that can be probed, thus direct calibrations are often not possible. The robustness of local calibrations for high redshift applications is an open question, given that physical processes may operate on different scales as we probe younger galaxies. The answer to this question is key for addressing how accurately we can probe the evolution of gas and stars over cosmic times. The current understanding of the star formation in the high redshift Universe, including the promise of gravitational lensing, will be reviewed. Conference fee: Conference fee is 1200 sek and includes receptions, coffee breaks, 4 lunch, social event (boat trip including dinner).